TONY TAYLOR HOME. . . . .Derry Republican Tony Taylor, who was released from Maghaberry on Wednesday, at his parents Creggan home on Wednesday night. He is pictured with his mum and dad Veronica and Willie, wife Lorraine (front), daughter Ellie-Jo and sister Joanne. The wife of freed Derry man Tony Taylor has spoken of her family’s relief and delight that he is finally home after spending almost 1,000 days imprisoned without charge. Tony and Lorraine Taylor, their children and the wider family are now preparing to spend their first proper Christmas together in three years. 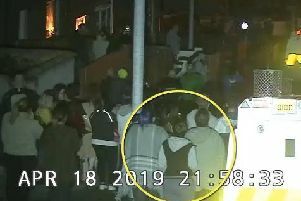 Derry Republican Tony Taylor gets a hug from his wife Lorraine after arriving home at his parents Creggan home on Wednesday night. There were emotional scenes on Wednesday evening as Mr. Taylor was reunited with his family upon leaving Maghaberry Prison and later as he visited his parents, Willie and Veronica, in their Creggan home. Mr Taylor had been released from prison on license back in 2014 but on March 10, 2016, while out shopping with his family, he was taken by the PSNI and returned to prison, where he had remained without charge until this week. It is understood the Derry man was released by the Parole Commission. Speaking to the ‘Journal’ yesterday, Lorraine said her husband was happy to be home with his family. Tony Taylor pictured with his mum and daughter, Ellie-Jo. “It is brilliant to have him home,” she said. “The children were enjoying collecting him and bringing him down to Derry and we went and visited Tony’s parents. There was some excitement and we were up until 2am this morning. Lorraine said they now planned to “chill out for a couple of days and get ready then for Christmas together. “Tony is a big part of our lives and it just means the world to everybody that he is back home and he will be a great help to me with Blaine,” she said. Derry Republican Tony Taylor, who was released from Maghaberry today, pictured at his parents Creggan home last night with his wife Lorraine and daughter Ellie-Jo. Lorraine led the campaign for Tony’s release, backed by a groundswell of support from people across the north west and beyond, along with campaigners, activists and political representatives who voiced their opposition to his continued detention. “My children were my rock and when I had a bad day I would look on Facebook and the campaign would be doing amazing, with people from Derry and all around the country and worldwide sending messages of support,” Lorraine said. “That great support from your home town and from worldwide, that kept me going every day, and my family was also a great support. Tony Taylor pictured with his dad, Willie, on his return home.